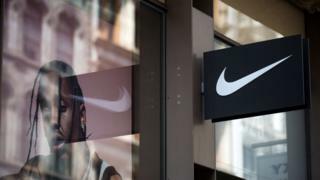 Nike has removed a balaclava from its website after it was accused of "targeting gang culture for profit". An image showing a black model wearing the product - which covers the majority of the face and appears to have straps and pockets - was circulated online. Some people on Twitter described it as "distasteful" and accused the brand of "endorsing knife crime". Nike said it was "in no way condoning the serious issues of criminal and gang culture". "These products were part of a wider Nike Training collection, styled on different models and available in multiple markets around the world," Nike said in a statement. It confirmed to Newsbeat that the balaclava had previously been available for sale on its website - but the listing was removed yesterday. Some people described the Nike x MMW balaclava as "distasteful", a "big mistake" and accused the company of enforcing "racial profiling". Others have defended the brand, calling the criticism a "stretch". While the product's intended use is to keep wearers warm, the military-inspired headgear has recently been popularised by drill musicians who often wear them in music videos. Those invited to the event were apparently sent shoe boxes with fake £50 notes and "burner" phones. The location where it was held was reportedly designed to look like a "trap house" - a place where illegal drugs are sold. Puma later apologised for its use of language, telling the Independent: "We want to make clear that Puma in no way endorses or intends to glamorise drug culture." One Twitter user linked the Nike and Puma incidents, tweeting: "We've had the Puma "Drug House" promotion and now Nike are using a black guy to promote a balaclava with straps and pockets. "Where there's blood there's money."